Dr. Kennita Carter, a physician at the VA Maryland Health Care System, was presented the Planetree Champion Award at the Planetree Convention in Denver, Co. Carter has been a pivotal influence in the early planning, dissemination, and ongoing development of the Patient-Centered Care/Planetree Initiatives at the VA Maryland Health Care System. She serves as co-chair of the Planetree Steering Committee and has a special interest in Integrative Medicine. 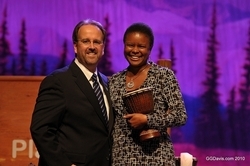 Dr. Kennita Carter of the VA Maryland Health Care System Named Planetree Physician Champion. Dr. Kennita Carter is an exemplary physician supporter and example of the concepts embodied in the Patient Centered Care philosophy. Founded in 1978 by a San Francisco patient who had endured a traumatic hospitalization, Planetree has been at the forefront of efforts to personalize, humanize and demystify the health care structure for more than three decades. “Dr. Kennita Carter is an exemplary physician supporter and example of the concepts embodied in the Patient Centered Care philosophy,” said Donna Felling, coordinator of Patient Centered Care/ Planetree for the VA Maryland Health Care System. Dr. Carter serves as a Planetree facilitator for employee retreats and actively supports the health care system’s effort to implement a more patient-centered approach to the delivery of health care. “Her efforts to increase patient-centered care have been invaluable for our staff and Veteran patients,” said Dennis H. Smith, director of the VA Maryland Health Care System. The Physician Champion Award recognizes a physician who champions the philosophy of patient and family-centered care and who is a role model for other medical staff members. The award Carter received was a Djembe (pronounced ‘JEM-bay), a skin-covered hand drum shaped like a large goblet which is played with bare hands. According to the people of Mali, the word “djembe” translates to “everyone gather together.” The drum is a member of the membranophone family of musical instruments, essentially a frame or shell covered by a membrane or a drumhead fashioned of rawhide or another material. At the October conference, health care providers from long-term care and acute care facilities, academia, patient advocates, administrators and health care executives gathered to listen to Dr. Andrew Weil deliver the key note address. Dr. Weil is an author and physician known for establishing and popularizing the field of integrative medicine. The attendees also participated in more than 65 workshops that focused on practical strategies for implementing and fostering a patient-centered care culture at their facilities. Today, the Planetree membership network represents a global community of more than 250 acute and continuing care facilities and outpatient clinics. Each of these facilities is at various phases in their efforts to transform their health care systems to a Planetree model. The Planetree philosophy considers every aspect of the health care experience from the patient’s perspective and reconnects staff to their passion for caring for others.